Um novo mês começou e esta rúbrica está de volta. Tenho adorado criar este posts e estar atenta às novidades para vos contar tudo. Outubro é um mês com imensas coisas a acontecer, por isso este post está repleto de sugestões para vocês. Desde um novo livro que estou a ler, a concertos pelo país, neste post têm tudo aquilo que não podem perder este mês. A new month has started and this post is back. I've been loving creating this posts and always being in the loop with everything that is happening to tell you everything. October has loads of things happening so this post is full of suggestions for you. From a new book I'm reading to concerts around the country, this post has everything you can't miss this month. O livro deste mês é um livro que ainda estou a ler e estou a adorar. 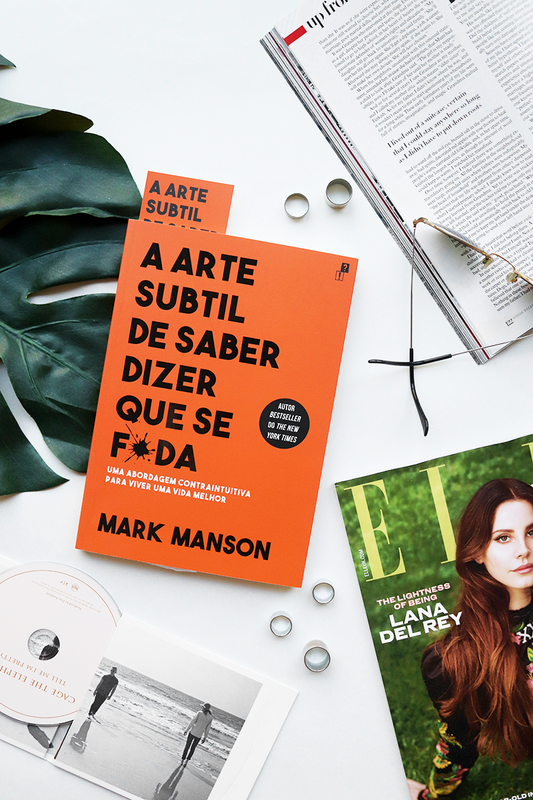 Estou a falar do A Arte Subtil de Dizer que se F*da do Mark Manson. Já há muito que queria ler este livro e quase que comprei a versão em inglês, mas quando saiu a edição em português fui logo comprar. O título é o resumo perfeito do livro, mas também é muito mais do que isso, é uma diferente abordagem à nossa vida e questiona tudo o que sabemos sobre a mesma. This month's book is a book that I'm still reading, but I'm loving it. I'm talking about The Subtle Art of Not Giving A F*ck by Mark Manson. I've been wanting to read this book for a long while and I almost bought the English version, but meanwhile, the Portuguese version was launched so I just had to buy it. The title is the perfect synopsis of the book, but it's also way more than that, it's a new approach to life that questions everything we know about it. Para comer têm mesmo de experimentar o The Happy Nest no Porto. Já vos falei um pouco sobre este café NESTE post, mas minha sugestão é irem lá ao fim-de-semana experimentar o brunch. O preço é de 12,5€ e ficam muito bem servidos. To eat you really have to try The Happy Nest in Porto. I have already told you about this cafe in THIS post, but my suggestion is to go there on the weekend and try out their brunch. The price is 12,5€ and it brings a lot of food. Este mês está repleto de coisas fantásticas para ver. A minha primeira sugestão é a exposição do Robert Mapplethorpe na fundação de Serralves. O preço para visitar a fundação é de 10€, mas podem aproveitar que no próximo Domingo, por ser o primeiro Domingo do mês, a entrada durante a manhã é grátis. Quanto a música, este mês há Kurt Vile & The Violators no dia 25 de Outubro na Lisboa Viva e no dia 26 de Outubro no Hard Club, no Porto, a entrada é de 25€ para qualquer um dos concertos. This month there are a lot of great things happening. My first suggestion is to go to the Serralves Foundation and see the Robbert Mapplethorpe's exhibition. The price to visit the Foundation is 10€, but since this next Sunday is the first Sunday of the month, the entrance is free in the morning. When it comes to music, this month we have Kurt Vile & The Violators on the 25th of October at Lisboa Viva and on the 26th at Hard Club in Porto, both shows are 25€.